The Morgan 4-4 was the Morgan Motor Company’s first foray into building four wheeled automobiles. The models made by the company prior to the 1935 debut of the 4-4 were all three wheeled cycle-cars with two wheels at the front and one at the rear. The choice of the three wheeled configuration was to take advantage of the British tax on cars, so the three wheelers were effectively tricycles and classed as cycle-cars and exempt from that tax. 1936 Morgan 4-4 Series I. This first model four wheeled Morgan would continue in production from 1936 until 1950. The Morgan 4-4 was a sporting motor car in the best British tradition and easily a match for the MG sports cars it was to compete with. 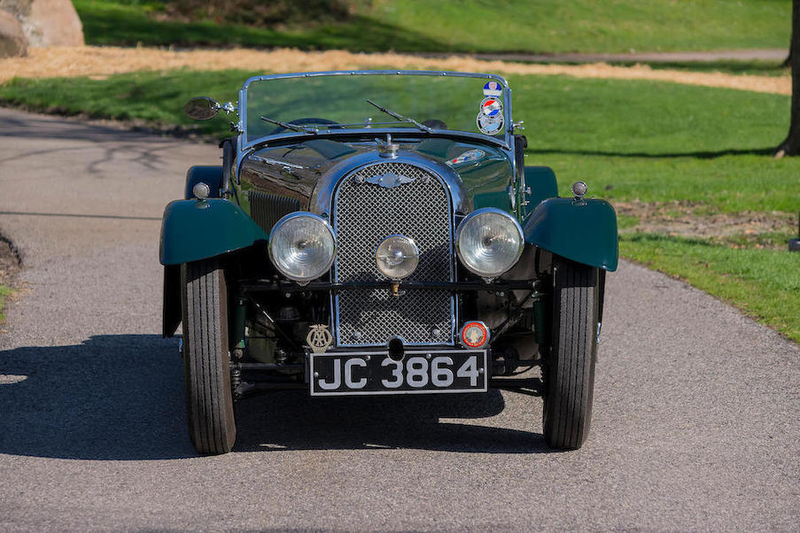 This was a sports car boasting an exotic Coventry Climax inlet over exhaust in-line four cylinder engine producing a spirited 34bhp @ 4,500rpm and mated to a four speed manual Meadows gearbox. The rear axle was a Salisbury unit whilst the steering box was a Burman-Douglass worm and nut type common on British cars of that era. The Morgan 4-4 was provided with twin spare tires which was a welcome feature. 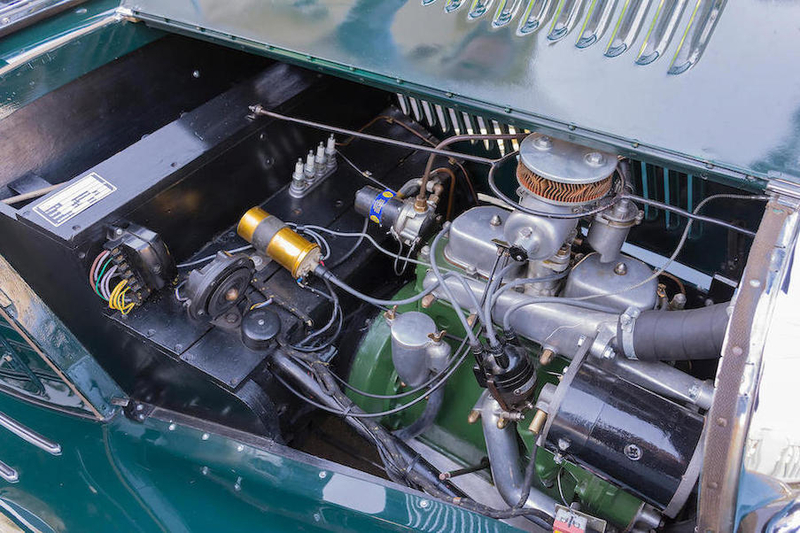 The front suspension of the Morgan 4-4 is described as a sliding pillar although the Morgan system was a little different to the sliding pillar of its predecessors such as the Lancia Lambda of 1922. In the Morgan system the pillar was fixed with the separate stub axle pillar sliding in it, using a coil spring. This system provided a somewhat lower unsprung weight than the original sliding pillar system. The rear suspension was a conventional live axle with leaf springs. 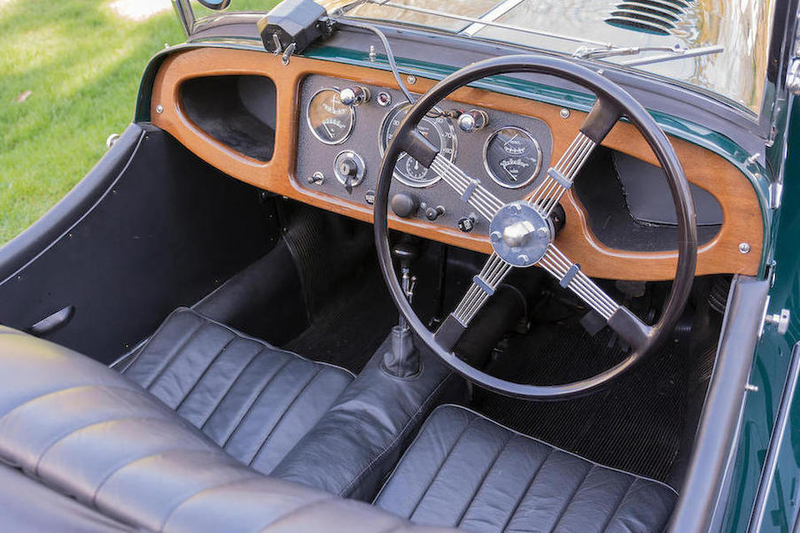 The interior of the Morgan 4-4 Series I is quite luxurious for a thirties vintage automobile. The Morgan 4-4 must have been an impressive motor car when offered for the first time in 1935. It was a great leap forward by comparison to the three wheeler cycle-cars that the company had become known for. 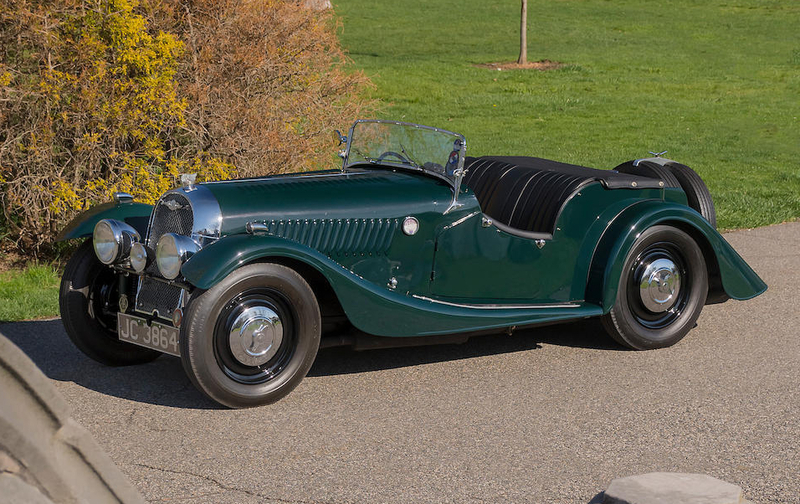 The Morgan 4-4 Series I is still an impressive car and was the ancestor of the Morgans that are in production today, still using much of that original design. In 1937 Morgan began offering a four seater version of the 4-4 and in 1938 moved up in luxury again by offering the 4-4 Drophead Coupé. Sadly the activities of a certain Mr. Hitler brought Morgan motor car production to an end during 1939, and in 1946 when all that kerfuffle was over the Drophead Coupé was not put back into production. Morgan 4-4 Drophead Coupé seen at a Bonhams auction in 2012. (Picture courtesy Thesupermat @ Wikipedia). 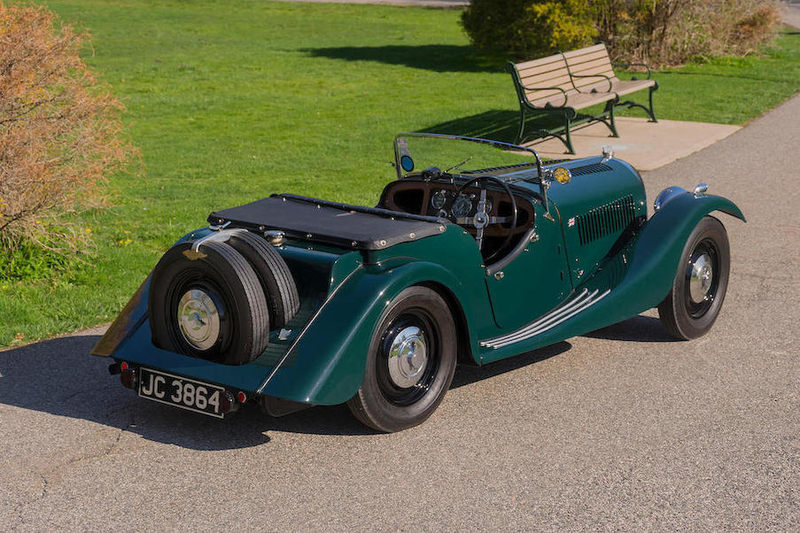 The green 1936 Morgan 4-4 Series I Roadster in the included pictures is coming up for sale by Bonhams at their Collector’s Motorcars and Automobilia auction. To be held at the Simeone Foundation Automotive Museum, 6825-31 Norwitch Drive, Philadelphia, Pennsylvania on October 2nd, 2017. The car is expected to sell in the range USD$40,000-$60,000. The 1,115cc Coventry Climax Inlet Over Exhaust Valve inline four cylinder engine features a single Solex carburettor. The sale car was restored in the early 1980’s and was being shown in concours events by 1982. The engine and carburettor were re-built in 1986. 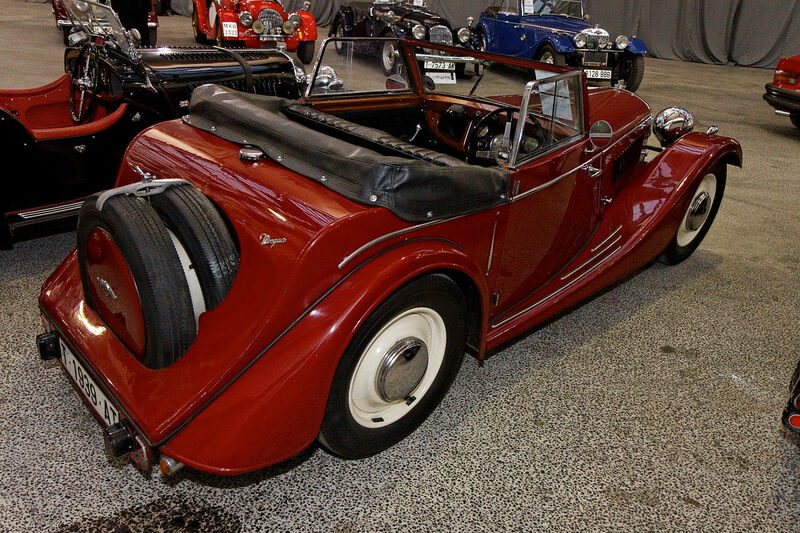 There were only 142 Morgan 4-4’s built in 1936, which was the first year of production, and so survivors are not common. These pre-war Morgans exude a great deal of character both visually and all the more so if you are privileged to drive one. This Bonhams auction presents the opportunity to own a first year of production example of these iconic British sports cars. (All pictures courtesy Bonhams except where otherwise marked).